Acknowledged author Michael L. Cain wrote Campbell Biology (11th Edition) comprising 1488 pages back in 2016. Textbook and etextbook are published under ISBN 0134093410 and 9780134093413. 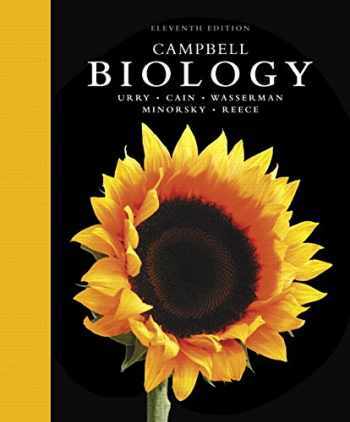 Since then Campbell Biology (11th Edition) textbook received total rating of 4.5 stars and was available to sell back to BooksRun online for the top buyback price of $51.58 or rent at the marketplace. Note: You are purchasing a standalone product; MyLab™ & Mastering™ does not come packaged with this content. Students, if interested in purchasing this title with MyLab & Mastering, ask your instructor for the correct package ISBN and Course ID. Instructors, contact your Pearson representative for more information. If you would like to purchase boththe physical text and MyLab & Mastering, search for: 0134082311 / 9780134082318 Campbell Biology Plus MasteringBiology with eText -- Access Card Package Package consists of: 0134093410 / 9780134093413 Campbell Biology 0134472942 / 9780134472942 MasteringBiology with Pearson eText -- ValuePack Access Card -- for Campbell Biology The World’s Most Successful Majors Biology Text and Media Program are Better than Ever The Eleventh Edition of the best-selling Campbell BIOLOGY sets students on the path to success in biology through its clear and engaging narrative, superior skills instruction, innovative use of art and photos, and fully integrated media resources to enhance teaching and learning. To engage learners in developing a deeper understanding of biology, the Eleventh Edition challenges them to apply their knowledge and skills to a variety of new hands-on activities and exercises in the text and online. Content updates throughout the text reflect rapidly evolving research, and new learning tools include Problem-Solving Exercises, Visualizing Figures, Visual Skills Questions, and more. Also Available with MasteringBiology™ MasteringBiology is an online homework, tutorial, and assessment product designed to improve results by helping students quickly master concepts. Features in the text are supported and integrated with MasteringBiology assignments, including new Figure Walkthroughs, Galapagos Evolution Video Activities, Get Ready for This Chapter questions, Visualizing Figure Tutorials, Problem-Solving Exercises, and more.